I was lucky enough to have seen this rarity in theaters (twice!) way back in 1982 and have had nothing but fond memories of it since. Years before Mystery Science Theater 3000 began it's film riffing ways, comedy superstars Dan Aykroyd, John Candy, Cheech and Chong and Gilda Radner were approached with the idea of making fun out of a bunch of cheesey 1950s sci fi films (and a few well regarded classics) by alternately sitting in a theater and mocking the clips as they come flying by. Breaking these clips down into categories (Gorillas, Aliens, Giants and Tiny People, A Salute To Edward D Wood Jr., Musical Memories, Prevues of Coming Attractions, Troubled Teenagers, The Animal Kingdom Goes Berserk, Technical Triumphs, The Brain, Getting High in the Movies, Monsters) the film was mostly a treasure trove of cool clips for us kids and teenagers living in the (just) pre-vcr days. I especially got a kick out of seeing some choice dialogue moments from Plan 9 From outer Space, re-living the wonders of A*P*E some six years after having initially seen it (in the very same theater, yet!) and the always welcome appearance of The Giant Claw (mere weeks after having first experiencing it on T.V.) which caused the attending audience to collapse into fits of laughter. The musical portion featured some incredibly racist numbers that will surely send unsuspecting viewers' jaws smacking to the floor. The live action segments were largely hit and miss, with Cheech and Chong faring best in the movie theater sequences (their reactions to the clips in the Getting High in the Movies sequence are priceless). Aykroyd tried too hard and came off as more overbearing than funny. Candy and Radner both faired well (some of Candy's riffs were MST worthy). It was obviously a rushed job (near the end of the Ed Wood tribute, Candy flubbs a line and it was left in) and I doubt any of it was given more than a couple of takes. Regardless, it has aged well and it is a joy to watch the ex-SNL and SCTV stars do their thing. They were obviously enjoying themselves and their enthusiasm is contagious. And where the hell else do you get to see a hitchhiking Gilda Radner get a ride from Cheech and Chong? 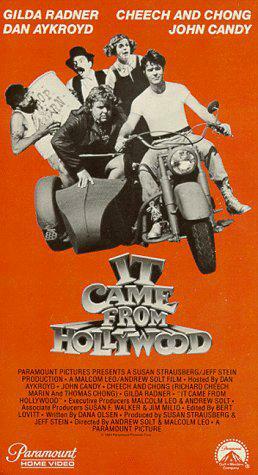 Unavailable at this time (with the oop vhs going for BIG bucks) 'It Came From Hollywood' while not perfect, is a real nostalgic delight and one that deserves far better home media exposure.